Twenty years ago it was the hybrid. Fifteen years ago it was the long putter. Ten years ago it was drivers with adjustable hosels. Today’s fad is undoubtedly putter grips. Although larger putter grips have been around for some time, it has only been recently that players have begun experimenting with added weight in the grip. In 1979, Paul Runyan wrote a book called “The Short Way to Lower Scoring”. In it he said, “I suggest that you avoid grips that seem a bit thin in overall diameter. You will find that a thicker grip encourages a firm-wristed stroke”. What is the physics behind counter-balanced putter grips? 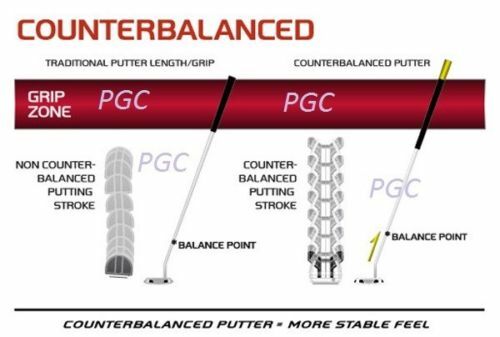 Basically, a counterbalanced putter grip is intended to do two things. (1). It is thicker and helps to encourage the firm-wristed stroke that Paul Runyan wrote of some 38 years ago. (2). In addition and more to the point of weight, it allows the player to customize the weight distribution throughout the putter. Back in 2007, K.J. Choi was the talk of the AT&T National before the first round had even began. He introduced the SuperStroke Fatso putter grip–a beast of a grip measuring in at 1.5 inches in diameter. Not that the grip wasn’t surprising enough, but the timing of this change had many questioning his state of mind. See, he had won the Memorial Tournament just weeks earlier with a putter that had a conventional grip. Although the trend started out slowly, as most trends do, the oversized grips became more and more popular. In 2015, SuperStroke introduced their “CounterCore Technology.” This combined the ability to add up to 50 grams of weight into the end of the putter grip. SuperStroke’s assertion was that this improvement would “promote a more repeatable-pendulum stroke, leading to less putts and lower scores.” This declaration was immediately embraced by Jordan Spieth who won multiple events in 2015 with a Flatso Ultra grip on his Scotty Cameron putter. This was music to SuperStroke’s ears. There are a lot of Tour players who have larger hands, therefore this was an easy transition for them. Both Bubba Watson and John Daly used to put a significant amount of tape under their grip in an attempt to build up its size. Now, they don’t have to. As usual with the tour pros, if it lowers their scores, it doesn’t much matter whether people like the looks of it. Watch a PGA tour event today and you will see anywhere from 40-60 players taking advantage of both larger grips and counter-balanced weighting in those grips. 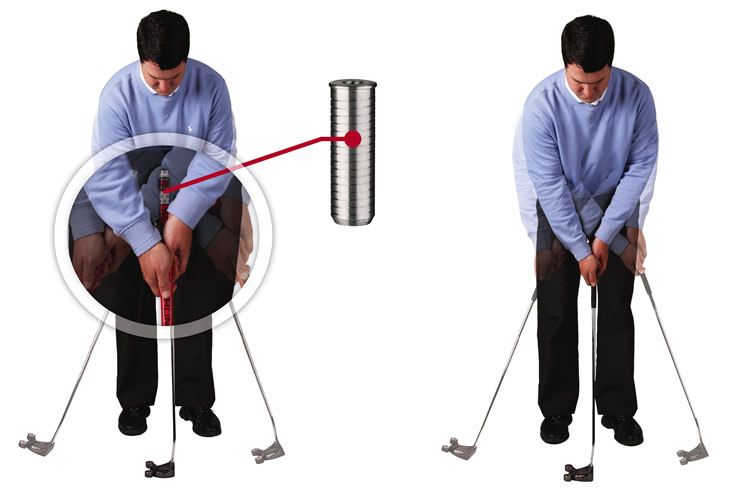 One of the most common swing mistakes, especially with the putter, is to grip too tightly. This technology should help address that and allow you to reduce the tension in your hands as you putt. Too many players get wristy, either with their top or bottom hand. This makes it hard to keep your putts on line. Larger, counter-balanced grips will help to curb this. Enough said…if it is more comfortable, hopefully it will make you more confident. Feel is a word golfers love to use. In the case of putting, feel is even more important. 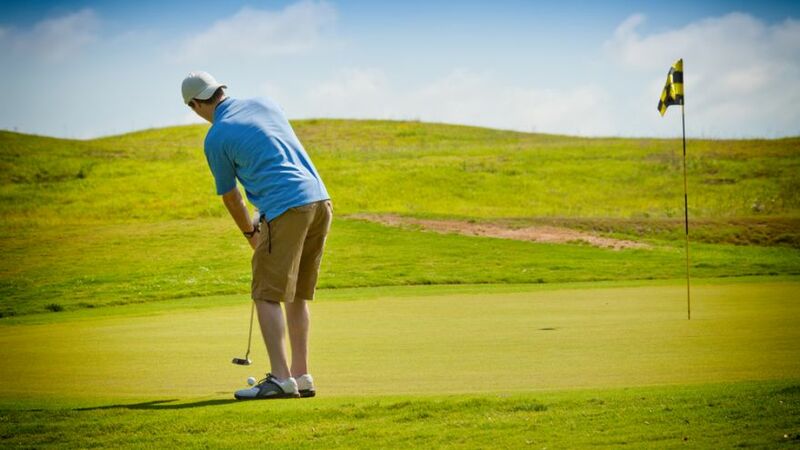 Without proper feel, distance control becomes difficult, and I believe distance control to be the most important element in becoming a great putter. Because of the added weight, it may be somewhat of an acquired taste. Counter-balanced putters are obviously going to balance out in a different way from a putter with a conventional grip. Again, it may take some getting used to. I hate to beat a dead horse, but…be patient if you are thinking about taking the step to using this grip. Don’t let it distract you from your overall game. This is all fine and well for today’s Tour players, but how does it affect recreational players? As is the case with a lot of new products that make it to market, manufacturers rely on everyday players like you and I to buy their product and make them profitable. The fact that it is good enough for a tour player makes it a marketable commodity. There is no reason to believe that this grip would not improve your putting stats. And, what makes it even more appealing, is that it is relatively inexpensive to make this change. The total cost; grip, weight and install charge, will come in at around 45$ at the most. If you are willing to spend a lot more on a Scotty Cameron putter, why would you balk at the price of installing a putter grip that would help you get the most out of your purchase?